It was a day with all of the feelings. I’m not talking about my daughter, and the cascades and surges of emotion that her Prader-Willi Syndrome lets loose. (Although we had this, of course. The clocks went back, for God’s sake, what did you expect? If your answer was: ‘1001 questions about the intangible concept of time, expressed in mainly low level panic about having had to get up TOO EARLY’, then you are correct! If you’re interested, my daughter’s other topics of panic for today were her losing a tupperware pot at college in the week, and needing EXACTLY the same pot for her packed lunch TOMORROW, plus a whole whack-a-mole pop-up set of worries about a forthcoming residential trip). No, it wasn’t just her battling with all of the feelings, it was me, too. And it was all about what was missing. Today was a day that I’d told myself didn’t matter and didn’t mean anything different from any other, but it did. It was Mothers’ Day. It’s the first without my mum. She died last August. It was the first without my mum-in-law, who died two weeks ago. I kept busy. The morning was spent helping coach the U10s at minis rugby, where my son actually agreed to join me and join in, whilst my girl sat in the clubhouse, doing word searches, as good as gold. The afternoon was spent dealing with the fallout from my daughter's clocks and pots and trip meltdowns, then popping to the cemetery to spend a quiet minute or two at Mum’s grave. I walked through the gate to be hit firstly by the glorious burst of colour from the fresh flowers that seemed to be everywhere, and secondly by the realisation that nearly every bouquet was for other missing mums. I cooked a roast for my dad. Eyed up two empty chairs. Two ropey, battered, faux leather dining table chairs that were snugly tucked in against the wall, because we hadn’t had to pull the table out like normal, because the new normal is two missing mums. The new normal still feels like an upside down world. But an upside down moment saved it. My girl presented me with a keyring she’d made at college. 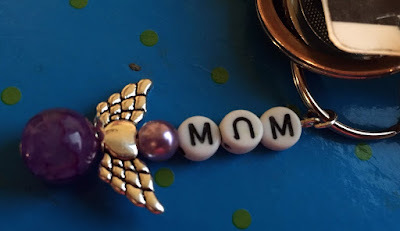 It has a winged heart and some letter beads spelling out ‘mum’. Or rather ‘mnm’. I flipped it over a few times, and twizzled the u bead round, but she’d put it on the wrong way. It can’t be fixed. It’s beautiful. It’s imperfect. It’s my girl. Down. It's the new up.